The CV3550 Double Sided Cover Stitch allows you to create a wide range of cover stitches on all types and weights of fabric for both decorative and constructive applications. It features both single-sided and double-sided tri-cover stitches, wide cover stitches, narrow cover stitches as well as a chain stitch. Additional points include a free arm, LED light, thread cutter, color coded threading, easy looper and cover spreader threading, a presser foot pressure dial, and snap on feet. The adjustment dials for stitch length and differential feed are now conveniently located on the right-hand side. 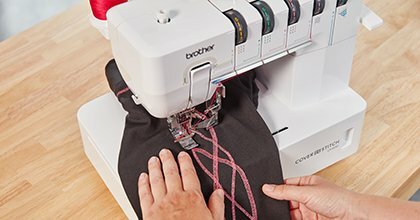 With 3 needles, one lower looper, and one cover spreader, the CV3550 creates not only professional hems, and chain stitching, but allows you to add double-sided cover stitching to your projects for a special one step finish previously unavailable. Double Sided Tri cover (6mm), Double sided Wide Cover (6mm), Double sided Narrow cover (3mm) stitches, Tri-cover (6mm), Wide Cover (6mm), Narrow (3mm) and standard chain stitching capacity. Large 6.1" x 3.9" workspace. Color coded threading guide & easy to follow lay in threading. Presser foot pressure adjustment dial.